St Mirren have terminated the contract of defender Marc McAusland, saying it was "by mutual consent". 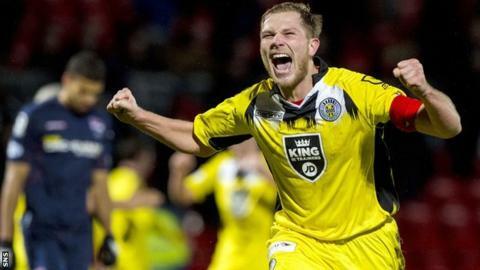 The 26-year-old had made 186 appearances during two spells with the Scottish Premiership club. His last came on Monday, when he played 43 minutes before going off injured during a 3-0 defeat by Ross County that virtually ensured their relegation. McAusland told the club website: "I feel it is now an appropriate time to seek a fresh challenge elsewhere." After Monday's game, manager Gary Teale was reluctant to concede relegation despite his side being 10 points adrift of Motherwell at the foot of the table. But he hinted that he would consider making changes to his side and introducing some young players from St Mirren's academy. Scotland Under-21 cap McAusland rejoined his hometown club from Queen of the South in 2010 and has deputised for captain Steven Thompson this season. "I would like to take this opportunity to thank everyone at St Mirren FC, especially Danny Lennon who brought me back to the club," said the Paisley-born defender. McAusland was part of the side that won the Scottish League Cup in 2013 under manager Lennon, who had made him one of his first signings. "I would like to thank all the supporters who got behind me and my team-mates and I hope they will continue to support the club positively in the future," he added. "I wish everyone connected with St Mirren good luck and I'm sure that it won't be long until the good times will return and I look forward to coming back to support the club when I can."